A former educator known for his laugh and his engagement with people, Neil Laurenson, has been honoured by the Pope for his service to education. 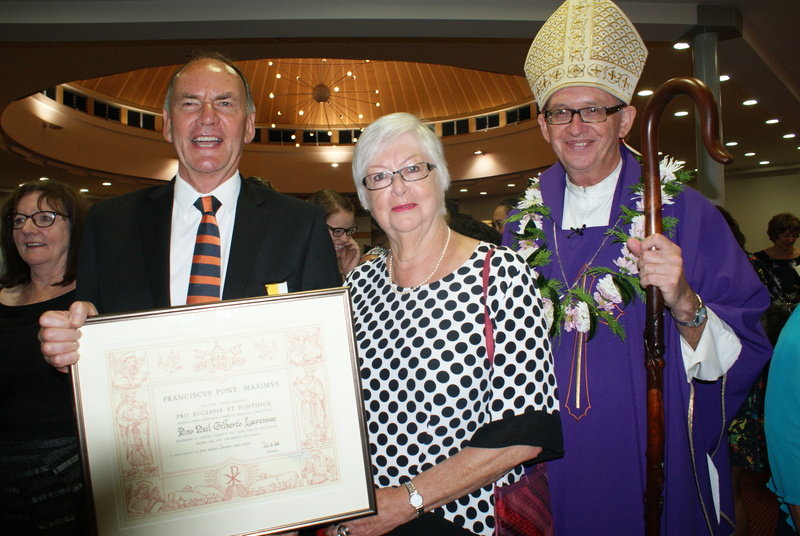 The former manager of the Auckland diocese Catholic Schools Office, Neil Laurenson, holds his papal award, Pro Ecclesia et Pontifice. With him are his wife, Lyn and Bishop Patrick Dunn, Bishop of Auckland. Mr Laurenson taught in the state system for the first 25 years of his career, then worked for the past 25 years as manager of the Catholic Schools Office in Auckland diocese. At a 2016 dedication Mass for teaching at Christ the King Church in Owairaka on February 16, the vicar for education, Linda McQuade, told the packed church that it was her honour to announce that Mr Laurenson’s service was being recognised by the Bishop of Auckland, Bishop Patrick Dunn, and Pope Francis. The award was Pro Ecclesia et Pontifice (for Church and pontiff) “for serving the Church in an outstanding fashion”. “Neil has truly served the Church in Auckland diocese through his outstanding work with our 42 primary school, 16 secondary schools and eight early childhood centres,” Ms McQuade said. “And in the way he’s led staff at the schools office at Pompallier Diocesan Centre,” she added. The dedication Mass included the awarding of certificates to scores of teachers — including to recently qualified teachers — and to others for the completion of further study.